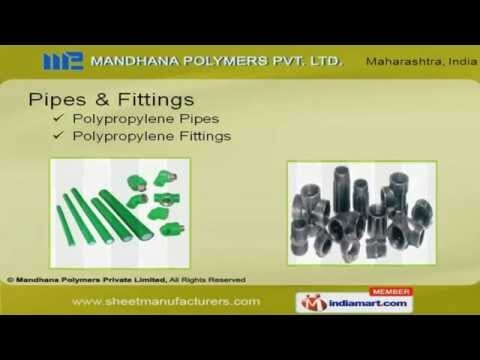 Welcome to Mandhana Polymers Pvt Ltd. Manufacturer & Exporter of Thermoplastic Sheets, Pipes & Fittings The company was established in the year 1992, at Mumbai. We follow International quality standards and our products are Applicable in Chemical, Steel, Furniture & other Industries. Assured quality, Cutting-edge technology & Highly Skilled professionals have helped us to attain an enviable position in the market.Our product line covers Sheets, Rods, Valves, Membranes, Process Equipments & Services. We offer Sheets that are of finest quality.We also provide Pipes & Fittings that are highly durable.Rods, Valves & Profiles offered by us are extremely reliable.Along with that we offer Membranes & Polyolefins that are a class apart. Chimney, Stacks, Blowers, Storage Tanks, Hoods & Covers are available under Process Equipments & Services.